With the world of dividend investing having now matured and expanded into an ever-more complex universe of business types, many income investors are understandably confused about taxes on dividends. Especially since the U.S. tax code has grown into one of the largest and most convoluted parts of our government. In fact, according to the Tax Foundation, the U.S. tax code has now grown to over 10 million words (up from 1.4 million in 1955). The 2017 Tax Cuts and Jobs Act only added to this complexity since it represents the largest structural change to U.S. tax law in over 30 years. Let’s take a detailed look at all of the most important considerations you need to keep in mind when it comes to the tax effects of the various dividend investing vehicles. Let’s start with the simplest and most common dividend most investors are faced with, qualified dividends from C-corps such as Johnson & Johnson (JNJ) and AT&T (T). Note that most U.S. mutual fund dividends are also qualified. Qualified dividends are taxed at the long-term capital gains tax rate, as long as you hold each stock long enough. Currently that means a holding period of 61 days or 60 days before the ex-dividend date (the date that, as long as you hold the shares by that point, you will receive the dividend). Qualified dividends are listed on tax form 1099-DIV in box 1B. Note that for those earning over $200,000 in adjusted gross income (singles) or $250,000 (couples), the 3.8% ObamaCare surcharge tax on capital gains and dividends still applies. The lower tax rate associated with qualified dividends can go a long ways. For example, for lower to middle class investors, meaning those with taxable income (gross income minus deductions) less than $39,375 for single people or $77,751 for married people, you won’t pay any taxes on your qualified dividends. With the median U.S. household income below $60,000 the vast majority of Americans will end up paying just a 15% tax rate on their qualified dividends. Even if you are in the top tax bracket (a nice problem to have), you’ll still pay 51% less than the top marginal tax rate, which is actually 37% plus the 3.8% Obamacare surcharge for a top tax rate of 40.8%. Any C-corps in tax-deferred accounts such as IRAs or 401(k)s face no dividend taxes as long as you don’t withdraw any funds. However, when you do start to take money out of such accounts, things get a bit more complicated. For example, any funds held in a Roth IRA are tax-free forever, including dividends and capital gains, as long as you don’t withdraw funds until after age 59.5 (and you’ve owned the Roth IRA for at least five years). Any cash withdrawn from a Roth IRA before this age will face a 10% penalty on any gains you’ve made, including dividends. However, with regular IRAs, as well as 401(k)s, once you begin withdrawing the annual minimum distribution (which kicks in at age 70.5), any funds will be taxed at your top marginal tax rate, including dividends. In other words, if you hold any qualified dividend-paying investments in a non-Roth IRA or 401(k), you lose the tax efficiency of owning those holdings in a taxable account. Real estate investment trusts (REITs) are a popular form of pass-through stock because of their unique tax structure. Specifically, REITs avoid paying corporate taxes as long as they pay out at least 90% of taxable net income to investors in in dividends. Due to this legal minimum payout requirement, REITs are one of the highest yielding sectors you can find, and thus a popular choice with income investors. U.S. REIT (non-U.S. REITs are generally taxed as qualified dividends) dividends are generally composed of two parts - unqualified dividends and return of capital, or ROC. Unqualified dividends usually make up the majority of the payout and are taxed as ordinary income at your top marginal tax rate (except in IRAs and 401(k)s before you withdraw any funds) – not the favorable rate we previously saw for qualified dividends paid by C-corps and mutual funds. ROC is a bit more complicated. Basically, returns of capital are what the IRS considers any part of the dividend above the REIT’s reported earnings (EPS). And because GAAP earnings are reduced by depreciation of property, when in reality well-maintained property appreciates in value, GAAP EPS doesn’t represent the actual cash flow that actually funds the dividend paid by a REIT. Rather, REIT dividends are paid for out of adjusted funds from operations (AFFO), which is generally calculated as Earnings Before Interest, Taxes, Depreciation, and Amortization (EBITDA) minus maintenance capital expenditures. AFFO is similar to a measure of free cash flow for REITs. Regardless, the IRS considers any dividends paid above a REIT's GAAP EPS to be equivalent to a return of capital (i.e. the company giving back your original investment). “Jennifer decides to invest in a REIT that is currently trading at $20 per unity. The REIT has funds from operations of $2 per unit and distributes 90%, or $1.80, of this to the unitholder. However, $0.60 per unit of this dividend income comes from deprecation and other expenses and is considered a nontaxable return of capital. Therefore, only $1.20 ($1.80 – $0.60) of this dividend comes from actual earnings. As you can see, ROC is deducted from your cost basis, and the government doesn’t get its share of the payout until you sell your shares, at which point the deferred ROC portion of the dividend is taxed as a capital gain. If you own shares for over one year, then this means paying a tax rate of 0%, 15%, or 20%, based on your marginal income tax bracket. The great thing about ROC is that taxes are deferred as long as you don’t sell your shares. And if you never sell, then up to the original cost basis of your investment can be permanently deferred. Once your cost basis hits zero, the ROC portion of your dividend is taxed as a qualified dividend. If you pass on your shares to your heirs, the cost basis steps up to the closing share price on the day you die, and the deferred tax benefit is permanent. Under the new tax code, up to $5.6 million for an individual or $10.2 million for a married couple can be inherited tax free. In other words, you could potentially leave your heirs a substantial income portfolio composed of REITs (or MLPs which also generate ROC) that is generating a very large income stream each year. REITs list how their dividend breaks down on their investor relations page early each year. They also send out two tax forms, a 1099 (for dividends) and an 8937 (for ROC). REIT investors should note that tax reform brought a major beneficial change to how all pass-through stocks (REITs, MLPs, LPs, YieldCos, BDCs) are taxed. Specifically, the first 20% of your payout is now deductible from your taxes, even if you don't itemize your taxes or have any wages. Thanks to a nearly doubling of the standard deduction (to $12,000 for individuals, $18,000 for heads of household, and $24,000 for joint filers), the vast majority of Americans won't be itemizing their taxes. However, they will still benefit from this new 20% pass-through deduction, at least through 2025 (it expires in 2026). Basically, this new pass-through deduction means that in taxable accounts your REIT dividend tax rate will decline by 20%. Those in the highest income tax bracket will see effective tax rates on REIT dividends fall from 37% to 29.6% (not counting Obamacare surcharge). Those in lower brackets will still see a 20% reduction but the absolute benefit will be proportionally less. Master Limited Partnerships are known for having extra tax complexity due to their use of K-1 tax forms instead of 1099s (with the notable exception of LNG Tanker MLPs, as well as MLP general partners which generally issue 1099s unless they themselves are MLPs). This is because, like REITS, MLPs are generally very capital intensive businesses (mostly specializing in energy storage, processing, and transportation infrastructure). As a result, these businesses record substantial depreciation expenses that lower their GAAP EPS. Since the business model of MLPs is to pay out the vast majority of distributable cash flow (similar to free cash flow for an MLP and equivalent to a REIT’s AFFO) as distributions to unit holders (i.e. investors), the distributions are almost always greater than EPS, making the vast majority of the payout a ROC. A key difference between REITs and MLPs is that almost 100% of an MLP's distribution is considered a ROC by the IRS. Thus it lowers your cost basis, and you pay capital gains taxes on units when they are sold. If your cost basis hits zero, then all future distributions are taxed as long-term capital gains. Another difference between REITs and MLPs is that MLPs are generally recommended to be held in taxable accounts, rather than retirement accounts (the opposite is true for REITs). This is for two reasons. First, because IRAs and 401(k)s don’t get taxed on dividends and distributions until you start withdrawing funds from the accounts, you don’t gain a tax advantage by owning these kinds of stocks. Owning MLPs in retirement accounts loses the important deferred tax benefit of ROC. The second reason is something called unrelated business taxable income, or UBTI. If your retirement accounts generate over $1,000 of UBTI in a given year, then you have to both report it (via a 990-T form) to the IRS and pay taxes on it at your top marginal tax rate, even if you own the MLP in a tax-deferred account. Note that most MLPs usually generate negative or zero UBTI, but some can have significant UBTI in certain years when they make large asset sales. In addition, keep in mind that because most MLPs are involved with energy transportation (specifically natural gas, oil, natural gas liquids or NGLs, and refined petroleum products), there could be a time limit on these kinds of investments. Specifically, as the world moves towards cleaner, more renewable energy, such as solar, wind, and hydro power, eventually demand for fossil fuels could peak and wane. For example, analyst firm McKinsey estimates that global oil demand will peak before 2040. No one knows for sure but, unlike some REITs which might potentially be owned forever and thus benefit from the permanent tax deferral of ROC, MLPs could have a limited time horizon of 15 to 30 years. To put it another way, be aware that, if you choose to invest in MLPs, you could be more likely to have to sell them within your lifetime and thus end up paying taxes on the ROC portion of the distributions you receive (losing the permanent tax-deferred nature of ROC distributions passed onto heirs via the step up of cost basis rule). YieldCos are pass-through entities similar to MLPs and REITs, in the sense that they can avoid paying taxes as long as they payout almost all of their cash available for distribution, or CAFD, (YieldCo equivalent to REITs’ AFFO or MLPs’ DCF), to investors. Most YieldCos consist of renewable energy assets, such as solar, wind, or hydropower generation capacity. These assets are generally under long-term, fixed power purchase agreements with large utilities for terms of 20 to 30 years. In essence, this makes YieldCos the equivalent of renewable energy utilities. Like MLPs and REITs, the capital-intensive nature of these stocks means that they have a lot of depreciation that lowers GAAP EPS and results in a large portion of their dividends being classified as a ROC. However, just because much of the distribution is a ROC doesn't necessarily mean you get a K-1. Some popular YieldCos such as NextEra Energy Partners (NEP) and Pattern Energy Group (PEGI) use 1099 forms, for example. Others, like Brookfield Renewable Partners (BEP), are technically structured as limited partnerships (LPs) and thus do issue a K-1 form. However, the key difference is that Brookfield Renewable Partners is structured in such a way as to avoid UBTI which means that it, as with most YieldCos, is safe to own in retirement accounts (no UBTI). As with REITs, YieldCo dividends are unqualified (taxed at your top marginal income tax rate), and the amount of dividends classified as a ROC by YieldCos can be found in their form 8937, which can located on their websites and tells you how much to reduce your cost basis by. Like most pass-through stocks, business development companies (BDCs) avoid paying taxes at the corporate level by paying out the vast majority of their profits and cash flow to investors. As a result, their dividends are unqualified with a minor exception. Specifically, if a BDC takes equity stakes in the companies it lends to, then a portion of the dividend may come from capital gains or the qualified dividends the BDC gets from the shares it owns in its clients. For example, Main Street Capital (MAIN) is one of the most popular BDCs, and a relatively high percentage of its portfolio consists of equity stakes in its customers. The capital gain portion of a BDC's dividends is taxed at your long-term capital gains rate rather than ordinary income. 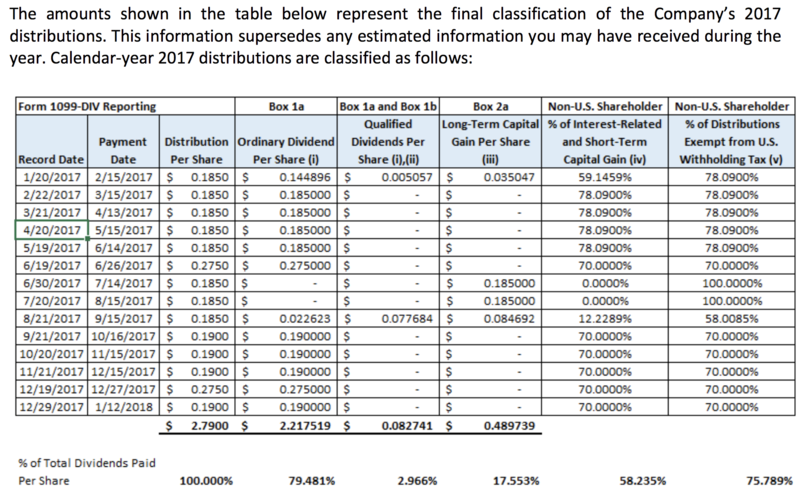 The breakdown of how much of each quarter’s distribution is qualified or unqualified can be found on a BDC’s investor relations website (under "tax information"). As you can see in the table below from Main Street Capital, the qualified / unqualified / capital gain mix can be highly volatile from one payout to the next. However, most of the time the distribution will be unqualified, except for those quarters in which the company sells the equity it owns in its clients. Close to 80% of Main Street Capital’s dividends declared in 2017 were unqualified. Since most of their dividends are classified as unqualified, it is beneficial to own BDCs in retirement accounts, which defers your tax liability until you start withdrawing funds (except for Roth IRAs where the benefit is permanent). And just as with REITs, MLPS, and YieldCos, if you do choose to own BDCs in taxable accounts, then the first 20% of BDC dividends are now tax deductible under the new tax code through 2025.
International dividend stocks can be a good way to diversify one’s income and gain exposure to non-U.S. economies, many of which are growing at faster rates than ours. But when it comes to taxes, there are some very important things to keep in mind. Most foreign stocks or American Depository Receipts, or ADRs (which allow foreign companies to trade on U.S. exchanges in U.S. dollars), will automatically withhold foreign taxes on the dividends that international corporations pay. There are some exemptions based on tax treaties in which countries like Canada will not withhold foreign taxes on shares held in retirement accounts. The good news is that, thanks to foreign tax treaties with the U.S., often the actual rate of foreign taxation is much lower. For example, the U.S. has a tax treaty with Canada that results in a 15% rate for dividends withheld for Canadian taxes, not 25%. The actual rate of foreign taxation is also usually lower because there is a dollar-for-dollar foreign withholding tax credit that American investors can claim that reduces (and for most people totally offsets) the foreign dividend tax withholding. In these cases, the effective dividend yield is unchanged from what you see on most financial sites. For foreign shares held in taxable accounts, you can deduct any foreign withholdings from what you owe the IRS, as long as your foreign withholdings are equal to or under $300 and $600 for single and married/joint filers, respectively. This limit applies to the simpler 1040 Federal Income Tax form. For foreign withholding amounts over this limit, you need to use the more complex form 1116, assuming you want to maximize your tax credits. The important thing to remember about this foreign tax credit is that any year’s benefit can’t be more than your U.S. tax liability. For example, say your total U.S. tax liability is $1,000 and your foreign tax liability is $500. In that case, you can deduct the entire $500 and pay only $500 to the IRS. But if your foreign tax liability is $1,000 and your U.S. tax liability is $500, then you can’t claim the full amount (which would result in the U.S. government sending you a $500 check). Instead you can deduct $500, bringing your total U.S. tax liability to zero, and then carry forward the $500 remaining foreign tax liability into the future, but for no more than 10 years. Any excess liabilities beyond that time frame will roll off (vanish) each year and be replaced by your newest annual carry over. However, keep in mind that claiming this credit might not be so easy, especially for investors with larger portfolios and thus high amounts of foreign tax withholdings. For example, if your foreign tax withholdings are above the $300/$600 limit, claiming the full tax credit requires filling out the complex form 1116, the instructions for which are 24 pages long. If you aren’t willing to go through this form for each and every one of your foreign dividend stocks, then you can simply choose to deduct your foreign tax withholdings (which show up on box 6 of your 1099). However, taking this simpler route means that you won't be able to deduct the full foreign tax withholdings from your taxes. Like with all U.S. tax deductions, the amount they reduce your U.S. tax liability is not the full amount (as with a tax credit), but a partial amount equal to your top marginal tax rate. For example, if you are single and making $40,000, putting you in the 15% tax bracket, and your total foreign dividend withholdings were $1,000, then the maximum you can deduct from your U.S. taxes is $150 (15% x $1,000 foreign dividend withholdings). Due to increased complexity, it might not be worth it for some investors to go through the hassle of filling out a form 1116 (or paying an accountant to do it), just to claim that extra $850. That's especially true if you own a lot of foreign-domiciled companies and thus would face a high bill from an accountant to handle this for you. Another important consideration is that any foreign stocks owned in tax-deferred retirement accounts are not eligible for these foreign dividend tax credits or deductions. And because there are over 60 different tax treaties between the U.S. and other countries, this can lead to some U.S. investors getting taxed twice on their foreign dividends. For example, while Canadian companies will automatically reduce the withholding rate to 15% without any additional paperwork on an investor’s part, Swiss companies will only honor the 15% tax treaty rate if your broker or wealth manager fills out separate paperwork ahead of time. Due to these extreme complexities about 90% of U.S. investors end up forgoing these tax credits, resulting in roughly $200 billion in over taxation each year according to Barron's. The good news is that some brokers, such as Morgan Stanley (MS) and JPMorgan Chase (JPM), will automatically consolidate all of their clients’ investments into aggregated omnibus accounts and file all the tax minimizing paperwork for them. However, other brokers such as Fidelity and Vanguard use global custodian banks to handle the taxes for their clients. Usually the custodians won’t automatically do the heavy lifting for you. Ultimately this means that U.S. investors investing in foreign dividend stocks should either check with their brokers to see whether or not they automate the tax withholding recoupment paperwork, or stick to a select number of countries with favorable U.S. tax treaties (such as Canada, the U.K., and the Netherlands). What about foreign mutual funds? While this can be a good idea if you go with a U.S.-based fund or ETF, you want to be careful to avoid foreign-based mutual funds, which the IRS classifies as passive foreign investment companies, or PFICs. The tax regulations for PFICs are even more complex and byzantine, but generally the dividends from such investments are treated as ordinary income and thus taxed at your top marginal tax rate. As you can tell, taxes on dividends paid by foreign companies are very complicated. The dividend amounts and yields displayed on our site for ADRs are net of withholding taxes, providing a more conservative look at the amount of cash you would actually receive. My personal preference is to stick with U.S.-based multinationals if I want to gain exposure to international markets. Preferred shares are a hybrid of stock and bonds in that they have a fixed dividend, a par value, and often a callable date, at which point the company can choose to buy them back at the par value. Most preferred shares have no voting rights but the dividends are generally cumulative, meaning that if a company has to suspend the dividend for some time, the dividends continue to accrue. Then, when the company is able to once again pay a dividend, it can’t pay common shareholders until it has paid back preferred investors in full. Preferred dividends are generally qualified and taxed at a lower rate than ordinary income unless they are composed of ROC, which is stated on the 1099-DIV form the company sends out each year (and is usually available online). However, note that qualified dividend treatment requires the underlying company to have a traditional C-corp structure. In the case of pass-through stocks such as MLPs, REITs, and YieldCos, the ROC component is deducted from the cost basis and taxed as a capital gain when the shares are sold or called (bought back by the company). And of course, as with all qualified dividends, the capital gains rate only applies for shares held one year or longer. Shares held less than this time will be taxed as ordinary income at your top marginal tax rate. Dividend ETFs have a major advantage over dividend mutual funds in that capital gains are taxed only when the ETF is sold. In contrast, mutual funds pass on capital gains to investors whenever the shares held by the fund are sold. That means that even if you buy and hold a dividend mutual fund, you are still accruing capital gains that you will be liable for. As far as the taxes on the ETFs’ dividends go, that depends on what kind of ETF we are talking about. For example, the Schwab U.S. Dividend Equity ETF (SCHD) tracks the Dow Jones 100 Dividend Index, meaning it selects only the top 100 financially healthy, non-REIT, MLP, or preferred shares that have been paying a dividend for at least 10 years. Thanks to its composition, this ETF pays only qualified dividends. On the other hand, REIT, MLP, or high-yield ETFs, such as the Vanguard REIT Index Fund ETF (VNQ), can and do include ROC as part of their dividends. This component of their payouts are taxed differently, as previously discussed. However, the good news for investors in these kinds of ETFs is that all of them still use traditional 1099 forms, meaning that even if you own an MLP ETF, you can forgo the added complexity of the K-1 form. What about foreign dividend ETFs? Well, there is both good and bad news here. On the plus side, as long as a company is headquartered in a country that has a tax treaty with the U.S. (most major countries do), then the dividends are qualified. However, the downside is, as we’ve seen with foreign dividend stocks, that you’ll still have to deal with foreign tax withholdings, including all the potential complexities of form 1116. As for bond ETFs, bond payments are unqualified, which means that their dividends are taxed as ordinary income. Essentially, you need to be aware of which types of securities a dividend ETF is invested in to understand the tax ramifications. CEFs are a hybrid of mutual funds and ETFs. Like a mutual fund, they are pools of capital run by active fund managers (and thus usually have much higher fees than ETFs). However, unlike mutual funds, the pool of capital is fixed so shareholders can’t withdraw funds. They can only sell their shares in the CEF. This is in contrast to mutual funds, in which redemptions can force fund managers to sell shares in underlying securities and thus create negative tax and performance implications. And like ETFs, CEFs trade throughout the day, while mutual funds are priced once per day, after the market closes. The kind of dividends received from CEFs, like with ETFs, can be qualified dividends, unqualified dividends, capital gains, or ROC. It largely depends on the kind of CEF you own and what the underlying holdings are. However, it’s important to note that, unlike ETFs, in which ROC is generally benign and merely reduces the cost basis of your shares, CEFs often have “managed distribution” policies. That means that in order to maintain investor interest, fund managers can, and often do, pay out more in dividends than the fund generates in the form of income or capital gains. This is a highly destructive form of ROC because it comes out of the pool of capital that the managers have to invest with on behalf of shareholders. In other words, this kind of ROC is equivalent to an unsustainable dividend that will eventually need to be cut. Not surprisingly, many CEFs have declining dividends (and share prices) over time because their investable pool of capital, which is fixed, shrinks over time if management issues too many ROC-based dividends. To avoid owning these dangerous CEFs you can a site like cefconnect.com to look at the distributions over time and what they are composed of. A CEF that pays out a lot of ROC and has a falling distribution over time is best avoided. Morningstar is a great source for checking both the track record of a CEF's NAV/share and what its historical distributions were comprised of. Note that the yield on CEFs (as with ETFs) is net of the expense ratio. Don’t let the complexity of taxes on dividends discourage you. Dividend growth stocks are still very much worth owning given their strong long-term performance, and understanding the basics of dividend taxes can result in thousands of dollars of savings. Thanks to online services such as TurboTax, it has never been easier for the average investor to benefit from the long-term wealth compounding of dividend stocks while minimizing the hassle that comes around each tax season. The key is understanding how each different type of dividend stock is taxed and which type of account it should be owned in to avoid surprises come tax time.